Austin Greenhaw is a 2004 graduate of Northeastern State University. He began his insurance/bonding career in January 2005 working for his family’s insurance agency, Howell-Stone Insurance, Inc. In January of 2018 he and his partner made a decision to merge with Rich & Cartmill, Inc.
Austin is involved in most all insurance, bonding and construction related industry associations in Oklahoma. 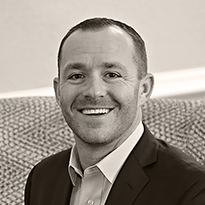 Austin previously served as president of the Oklahoma Surety Association and on the board of directors of the Association of General Contractors. Also, he has been on many committees of other organizations. Austin is married to Kellie Greenhaw and has 3 children, Blake, Sam, and Jax. He and his family attend Life Church in Edmond, OK.